Here comes Minelab CTX 3030 MD review. This device is one of the best nowadays. So, what are its advantages and disadvantages? 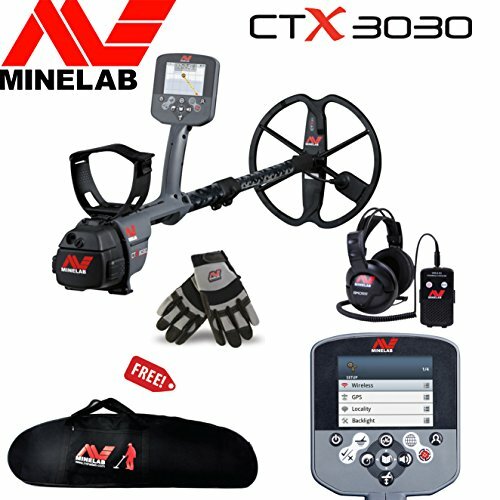 What makes Minelab CTX 3030 so special? Are there any metal detectors better than this one? And the most important question – whether this device is worth its money? These are the questions I’ve asked myself, I kept reading different forums, reviews, characteristics and I’ve seen quite a lot of video reviews. Now I’m ready to share my opinion with you. What is the most important, I’ve been using this MD for 160-200 hours of treasure hunting. A friend of mine has got one. So, we’ve tested it together on various types of ground: beaches, fields, areas with lots of litter, abandoned gardens, sports grounds etc. Then we exchanged our metal detectors and I did feed with my own hands the difference between my E-Trac and his CTX 3030. If you are the lucky owner of Minelab CTX 3030 or willing to be the one you are very welcome to write your comments and feedback. Any of your opinions are highly appreciated and important to those who are just planning to buy this device. Our current review is a follow-up to the previous article about the best metal detectors. Once you look through it you’ll see that Minelab CTX 3030 was called the best among all the reviewed metal detectors. Well, it’s been quite a while since I wrote my review, maybe I’ve changed my mind? Let me answer now – no, I still think that Minelab CTX 3030 is the best metal detector ever and I still dream of buying it. Oh, why is it just a dream…well, it’s plain and simple – I can’t afford it unfortunately. Sad, but it’s true. And now, let’s start from…2012. That was the year when the Australian company Minelab introduced its new upgraded metal detector called CTX 3030 model. Even nowadays this MD is still the leading one as for operability and functionality, not to mention what a breakthrough it was 5 years ago. E-TRAC was and yet is a “younger brother” for this model. The question is whether any better metal detectors have been designed recently? Well, the answer is yes and no. Of course, the company continues growing and it has created some new MD models. However, most of them are aimed at lump gold hunting. It’s easily explained by the fact that Minelab is an Australian company, so lump gold can be found quite often over the continent. The new MD models are completely different, even when speaking about the basic technologies they use. I was quite shocked by the prices, which are rather high even in comparison with CTX 3030, which isn’t cheap at all. All above mentioned brings us to the point that CTX 3030 doesn’t have any comparable alternative. All we are left with is good old-fashioned E-TRAC, though we’ll discuss the difference between these two models a bit later. Now, what exactly makes CTX 3030 so unlike all the other metal detectors on the market? It is a multi-purpose device meant for hunting at any weather conditions and over any ground type. Due to its waterproofness, the MD can be used for hunting both on the ground and under water up to 10 feet (3 meters). This means that you can take the device to the beach and to the field, get soaked wet without worrying if the device is safe. However, please keep in mind that this isn’t a metal detector for deep water hunting. Still 10 feet isn’t the depth where you may find some gold from lost galleons, nevertheless it’s not recommended to go deeper with this metal detector. Minelab metal detector was the first one to get a large colored LCD display which is very good even if you use it in the direct sunlight. The device control unit is not portable and it is placed rather high on a carbon arm. A wire that is connected to a coil is a weak point of all cheap metal detectors. CTX 3030 uses a wireless technology of sound transfer. Which means that there is no wire that interrupts the hunting process and can be easily torn off. At that you still have a choice whether to use a wireless external speaker or headphones that come in the device set. However, please don’t forget that they won’t do for underwater treasure hunting. Traditionally KOSS is the manufacturer of speakers for Minelab. Wireless speakers for CTX 3030 have a standalone control unit fixed on a user’s waist. It is connected to the speakers by means of a coiled cable with a common 3.5 mm jack. For underwater hunting you may also use waterproof wireless headphones. This MD has an embedded GPS detector therefore you can leave your portable GPS-navigator at home. Besides, the detector can be synchronized with your computer. Now you can ask me – what is GPS for? This is just a metal detector. Its main task is to search for treasures, but not to locate the position. On one hand I agree with you, but on the other hand you are wrong when saying so. By means of Google Maps and a program for PC XChange 2 you’ll clearly see where your findings were detected and where there was nothing. When at home you can look through your root one more time and check which section you may have skipped. Experienced treasure hunters will understand what I mean. Though it’s a fact, that once your GPS navigator is “On” the device’s battery discharges faster. However, the battery charge is still enough to perform continuous operation during a whole light day. In plain English, it means that the detector “shoots” a whole bunch of frequencies into the ground and this way it won’t let you miss neither a small coin, nor a large object. Another plus is that this characteristic allows working on highly mineralized soils, where single frequency MDs are of no use. As for Minelab CTX 3030 rivals – even their flagship models can work at only one frequency at a time, all you can do is to switch between different frequencies consistently. Minelab CTX 3030 metal detector is designed using FBS2 technology, that allows treasure hunting at 28 frequencies simultaneously in the range from 1,5 to 100 kHz. High frequencies appear to be more sensitive to detect small targets and low frequencies sense deep lying targets better. FBS simultaneously sends and analyses a complete range of multy-frequencies from 1,5 kHz to 100 kHz. Which means that the MD is sensitive enough to detect both small and large deep lying targets at the same time. This is the ability to detect targets basing simultaneously on their conductivity and iron content. It also helps to define your target type yet more precisely (ferrous or non-ferrous metal), its size and depth. Such an approach is the most accurate technology to define whether the target is something valuable or just some junk. By means of Target Trace and Target Separation you can see between some rust nail and a coin lying close together in the ground. When using any common metal detector in this case you’ll clearly see just the nail since it’s heavier and its mass will just hide the coin lying next to it. It has two adjustment modes: manual and automatic one. The user manually adjusts the device to work around homogenous ground – this allows searching at ultimate depth. The automatic adjustment mode is used on mixed soils to perform the device selftuning to current hunting conditions. The device has 10 search modes: 5 of them have pre-set ground balance values and Fe-Co discrimination and 5 modes set by the user. Minelab CTX 3030 has quite complicated settings and that’s a fact. However, its manufacturers have foreseen this obstacle and that’s why the MD has 5 embedded pre-set modes. These are for coin, beach, relic, silver hunting and for working on the ground littered with rubbish. For those who want to create their own search modes the device has 5 more channels. One of the main demerits of this metal detector (except its price, of course) is its considerable weight. The company engineers have done their best to prevent your hand from getting tired while using the device. The waterproof battery unit of CTX 3030 is quite large and it is placed on the upper section of the MD rod, so this way it acts as a counterbalance. But what has caused such an innovation? The answer is very simple – using coils of smaller or larger diameter has always lead to imbalance. User’s hand would grow weary in a short period of time, but now the metal detector is much better balanced. The device is powered from a lithium battery, which full charge is enough for 11 hours of operation. If you turn of GPS and Wi-Stream the MD operation time increases sufficiently. A special box that comes in the set allows using 8 AA batteries. It doesn’t seem to be rather significant benefit, but only if English is your mother tongue. Nevertheless, just imagine trying to get through the adjustment process, if you don’t speak English and live overseas. In this case you can choose one of the following 10 languages: English, French, German, Italian, Chinese, Polish, Portuguese, Russian, Spanish or Turkish. A standard set of Minelab CTX 3030 is equipped with Minelab CTX 11” Smart coil. The manufacturer also provides other coils of different diameters for this detector – 17 inches and 6 inches. The 17 inch one is used for hunting around large areas (it searches 20% deeper in comparison with an ordinary 11″ coil), and 6-inch coil should be used on some littery ground. For example, the place you’d like to search through is near some electricity transmission line, which happens quite often by the way. Ordinary metal detectors get blind since electricity causes high disturbances. But not for Minelab CTX 3030, which has a “noise cancel” function. Now let’s talk about the device disadvantages. Have you thought about any? If you use ordinary batteries, not the accumulator rechargeable battery you’ll need a lot of them. Eight batteries get low during a light day without using any additional options such as GPS or other embedded functions. The device’s weight is its demerit as well (5.6 pounds). But the manufacturer designed the MD so, that the main load falls on its accumulator. It isn’t easy for a newbie to understand all the technical peculiarities, especially if you want to get the best of this metal detector. Therefore, at first, you’ll have to use its standard modes. This MD is really heavy; however, it is well balanced due to its coil that comes in the set. But right when you change the coil for 17-inch one the device turns into a “kettlebell”, since the balance changes. The good news is that you can use Minelab Pro-Swing 45 – a special webbed gear, which perfectly deals with this issue. Well, this is the main obstacle once you’ve decided to buy CTX 3030, since quite few treasure hunters can afford purchasing a metal detector that costs xxxxx$. E-trac is a metal detector model that is prior to Minelab. Lots of tests and comparisons were performed and there were many discussions as for which one is better. If it is worth paying extra $ for CTX 3030? E-trac and CTX 3030 search depth varies in 1-2 inches, which doesn’t make any significant difference. Due to the fact, that completely different processor is used by CTX 3030, it has high response and better discrimination function unlike E-trac. Experienced owners of E-trac metal detector know that you should walk slowly with it, once you move faster you won’t find anything. This is because the device processor is less speedy. Even though the MD has the same 28 frequencies, it just can’t process all incoming signals fast enough. In this respect CTX 3030 is much faster, because it was designed and manufactured later than E-trac. Now processors are light years away from those that were used when E-trac was designed. Just think about your first PC. Minelab EQUINOX 800 Multi-IQ Metal Detector with EQX 11" DD Smart Coil, Wireless Headphones and WM08 Adapter. So far E-trac still is the one to be used when working on mineralized soils and saliferous rocks. The device ensures stable and faultless operation with an impressive search depth value. This metal detector is one of the leaders both in search depth and discrimination function performance. CTX 3030 metal detector is not a restyled model, it is a brand-new MD model. Its developers have not only upgraded the device, but they have also fulfilled a totally new concept in it. As for the search characteristics, the metal detector level almost hasn’t changed – there was no impressive breakthrough as for targets detection. But all too often this isn’t the deal. What is more important, is that the device clearly hears the target signal among any scattered metal rubbish and CTX3030 deals perfectly with this task. СТХ 3030 has inherited the best from E-trac – it has become faster, it recognizes targets clearer, searches a bit deeper, it is capable of underwater treasure hunting and its operation time (using accumulator) has increased two folds. The device has excellent color LCD display, GPS, well designed rod, wireless headphones unit and other stuff – which is another cherry on the cake. As for me, I decidedly choose Minelab CTX 3030 as a more sophisticated MD model. When you pass the target on the edge of threshold noise and the MD can’t define the target metal, conductivity and the discriminator shows nothing as well as the target depth can’t be defined – push Pinpoint button. Using Pinpoint the device easily captures and locates the target which the MD couldn’t detect earlier. After that carve out a soil divot with a spade and put a coil into it – now the detector will clearly display all the information it gets. Sometimes it is reported about а little slop that appears in the rod parts fitting together. In this respect, we’d say that it is a must to wash the device rod and coils after treasure hunting (in the woods, fields, lake, see etc.). The thing is that the sand (i.e. abrasive substance) scrubs internal and external coating of the rod moving parts and causes a gap between them. The device is ok with water, so wash it once you’ve finished searching before putting it back into the case. As for the accumulator storage. The device has a lithium-ion battery, so when you aren’t using it it’s better to store the battery 50% charged – this way it’ll serve longer. Many battery chargers have a charging mode “for storage”, however a standard one doesn’t have it. Minelab Pro-Swing 45, which is a special webbed gear, will perfectly help you if your hand still becomes tired very quickly when working with this MD. The manufacturer doesn’t recommend storing this metal detector in your car trunk in summer. The LCD display may swell because of high temperature, though it doesn’t affect the device operability, it just doesn’t look nice. If you’ve found yourself in a highly littered with rubbish ground, turn off Multitone and switch to 5 tone mode. Otherwise it’ll drive you crazy. It makes sense to buy one more battery unit only if you go treasure hunting somewhere without any chance to charge the MD battery and you don’t have a car. The standard battery unit is enough for a day of the device operation with all additional functions on. If you turn them off, it’ll work even longer. I stick to my opinion – Minelab CTX 3030 is the best metal detector nowadays. It doesn’t mean that it doesn’t have any disadvantages, but it is worth each dollar spent on it. Due to its price, not everyone can afford buying it. But if you have enough money, you won’t regret purchasing exactly this MD. However, don’t expect for a miracle to come – it is just a device, though a high quality one. But it is you who goes treasure hunting, not the device. Once you get how to adjust it and use all the features, you’ll find your treasures where all the rest find nothing. You can easily sell the MD if things go wrong and you won’t be able to work with it. Anyway, you don’t lose anything. Life is too short and you should take the best of it. Especially if it concerns your favorite hobby.